You love it! I love it! Developmental Baby Massage and Movement Programme for Parents in South Wales and South West of England. On this MumMeBaby page you will find information about Developmental Baby Massage and the benefits for your growing and developing baby. Touch is the primary sense your baby understands. Remember your first skin-to-skin contact. Simple massage will help you to develop a deeper understanding of your baby’s needs. How to comfort, calm and relax your little one. Its fun and you will enjoy this unique connection between you and your child. 'Your baby's tummy is a great source of tranquility'. By relaxing your baby’s tummy you relax your baby. Helps with bonding & relaxation. Calms the nervous system, which can improve sleep. Reduces the discomfort of colic, wind & constipation. Helps muscle tone, strength and flexibility. Assisting head control and physical coordination of the trunk, legs, arms, and shoulders. Three steps for assisting sitting and standing. Cranial sacral technique to relieve tension and fractiousness especially if you have had an assisted delivery, for example: ventouse or forceps delivery. Techniques to relieve from lung congestion and glue ear. This informative three weeks course can be introduced from 6-8 weeks, following the Newborn Examination check by your GP. Introduction - what you need to begin. Massage techniques will be demonstrated on a massage doll. You will be massaging your own child. A routine will be shown and built upon weekly. Tuition will be guided by the mood of the class. Each class lasts approximately 45 minutes. When your baby is independently sitting, it is a time to encourage a full range of versatile movement. This will maintain flexibility as the physical strength of your baby increases. Remember: ‘You can build strength on flexibility but you can’t do the opposite’. A safe way to introduce easy stretches into your playtime together. These sessions encourage physical and emotional ties with you and your baby. Developing self-confidence and trust in your relationship. * Remember, your baby should be over six months of age and ideally having followed a course of Developmental Baby Massage. Birth is regarded as one of the most beautiful events of life. However, the reality may be different. In this section of MumMeBaby you will find information about the effects a birth may have on the baby. Cranial Osteopathy for newborn babies is an alternative for relieving strains and tension of the birth as opposed to traditional medications. And can be used to improve your baby’s feeding and wellbeing. Discomfort that a mother may experience in pregnancy and birth could contribute to an increased level of tension in the baby. The stress and difficulties of a prolonged or even a very quick birth may have an effect on your baby's behaviors such as: ability to feed effectively, difficulties to relax and settle in between feeds and sleeping time. There is a theory that if the baby is in a persistently alert state, milk may exit the stomach before it has had chance to digest. The partially digested milk enters the intestine where it may ferment and produce wind, which can be uncomfortable for the baby. The baby is subjected to enormous forces as the uterus pushes to expel it against the tight cervix and the naturally resistant birth canal. This can be stressful for the baby however it has the remarkable abilities to absorb this pressure by reducing the size of its head during birth. Many babies are born with odd shaped heads as a result. In the first few days, the head gradually loses the moulded shape, as they suckle, cry and yawn. However, this unmoulding process is often incomplete, especially if the birth has been difficult or was assisted with forceps or ventouse. Some babies may cope with retained moulding and compression of the head. Others may appear irritable for long periods without giving away the obvious reasons. This often occurs especially when lying down or during feeding sessions and may cause anxiety to those who care for them. Nerves that exit at the base of the skull and lead to the lips, cheeks and tongue can be directly affected by the birth. The infant needs these nerves and muscles to function well to secure a comfortable latch, suckle and effective milk removal. Tension in muscles and soft tissues. The oesophagus (the tube to the stomach) passes through a sheet of muscle under the ribs called the diaphragm. Stress from a difficult or fast birth can cause tension in this area. Any strain through the umbilical cord, for example, the cord was around the baby's neck, can add to strains in the abdomen. 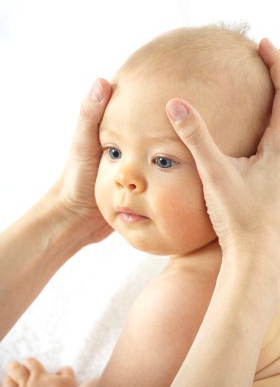 Osteopathic treatment using the cranial approach is gentle and effective for babies . Very specific, light pressure is applied where necessary to assist the natural ability of the body to release stresses and tensions. Reactions to treatment are variable. Often the baby is relaxed afterwards and sleeps well. Others have a burst of energy after treatment, usually followed by a good nights sleep. Occasionally babies are unsettled after treatment. This is a temporary situation, and usually clears within 24-48 hours. The MumMeBaby Clinic runs in parallel with a professional and experienced team of Cranial Osteopaths with postgraduate training in Cranial Osteopathy in neonates and paediatric osteopathy.